IM-elect Emory Tate has been hot in the news this year having participated in the U.S. Championship and having earned his 3rd IM norm. He continues to have good success against Grandmasters and the latest casualty at his hands is GM Alexander Ivanov. This game was fairly one-sided as Ivanov played a dubious line in the Modern and ended up defending a weakened kingside. Like a predator with heightened scent of blood, Tate stalked the black king and launched a kingside pawn storm. Black's pieces were uncoordinated to prevent the final onslaught and Tate ended the game with a nice tactic. Recently Tate has been playing in Europe with the idea of gaining access to tougher competition and more norm opportunities. If history is any predictor of his performance, we will have many more games to feature here! 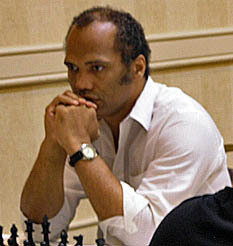 "IM-elect Emory Tate vs. GM Alexander Ivanov"